AMHERST — On Friday night, the No. 9 Boston University men’s hockey team took the ice at the Mullins Center three days before its upcoming Beanpot championship game. 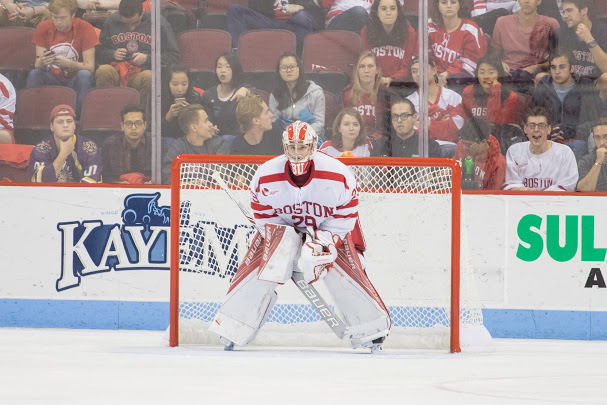 But before the Terriers (16-7-4, 9-4-3 Hockey East) could shift their focus to No. 4 Boston College, they had to face the University of Massachusetts Amherst in an important league game. 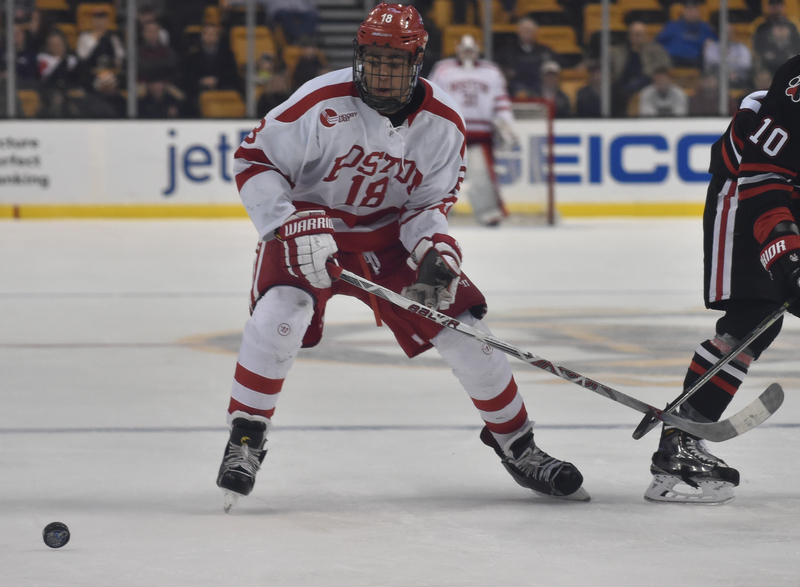 BU scored four goals in the first period en route to an eventual 6-3 win over the Minutemen (7-17-4, 2-12-4 Hockey East), extending BU’s winning streak to five games. Here’s what we liked in the Terriers’ win. 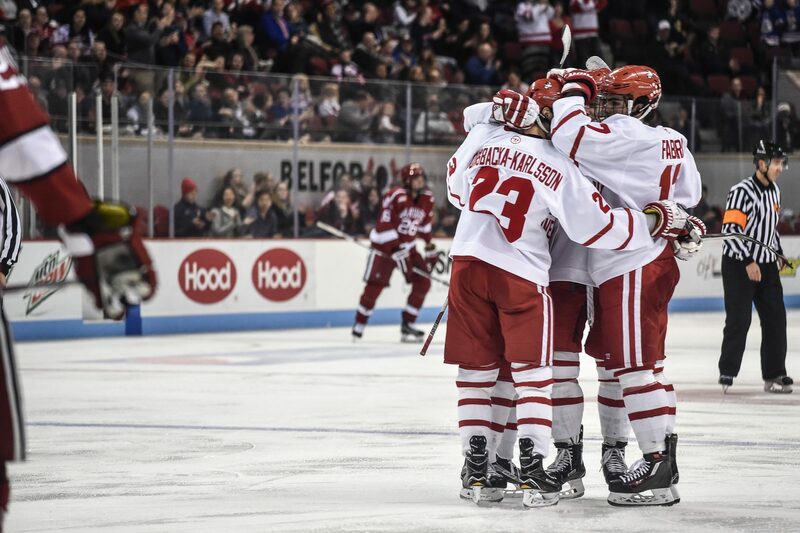 BU’s fourth line of sophomore winger Chase Phelps, senior center Mike Moran and junior forward Tommy Kelley accounted for two of the Terriers’ six goals and four of their 15 points on the evening. Andrew has more about the trio’s success in his sider. It’s been a trend for the Terriers this year, especially as of late, but BU got goals from all throughout the lineup on Friday night. Three of four lines registered markers and at least one player on each d-pair had a point as well. 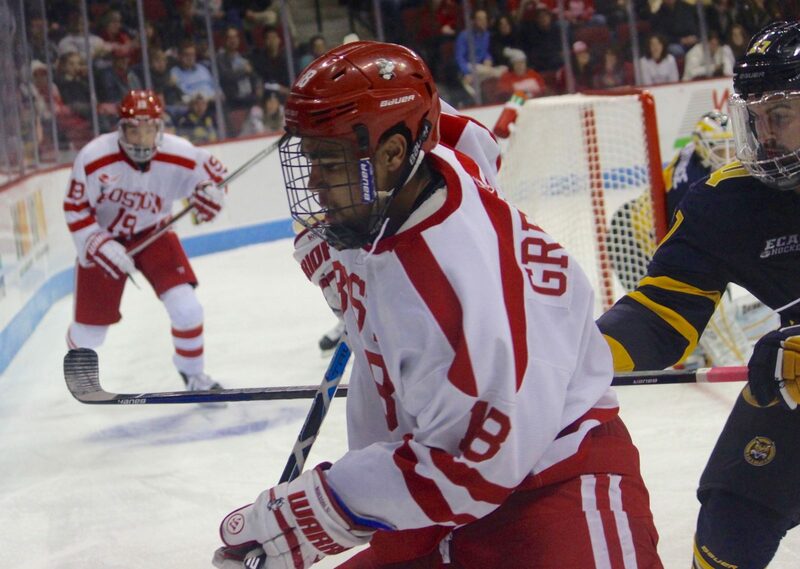 In his third multi-point game this season, freshman wing Jordan Greenway found the back of the net twice for his third and fourth goals of the year. Greenway now has at least one point in four of his past five games and has posted a 2-5—7 scoring line in that time. 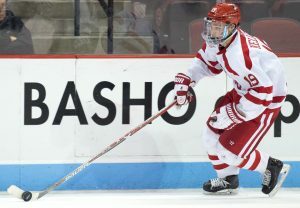 Greenway added that his two senior linemates, assistant captain Matt Lane and forward Ahti Oksanen, have taught him “little things” that they’ve learned in their time at BU. Freshman winger Oskar Andrén was rewarded for his increasingly good play on Friday night in the form of his first collegiate goal and what would be the game-winning tally. Andrén ripped the puck in the slot and roofed it over goalie Nic Renyard to put BU up 4-1 at the end of the first period. “It’s nice to see him get rewarded with a goal,” Quinn said. While I wasn’t late to the game at Mullins Center last season (I actually made it in time for warmups! ), Sarah, Andrew and our old pal Conor Ryan were kept from Amherst by some pretty heavy Columbus Day traffic. This year, however, we all got there on time and had a blast, woo! As mentioned before, UMass was pretty prolific on the power play Friday, scoring its first two goals of the game on the man advantage. The opening marker for the Minutemen, however, probably shouldn’t have counted. About seven minutes into the first period, with bodies in front, senior goaltender Sean Maguire looked to have successfully saved and held onto the puck and so the officials blew the whistle, signaling that play was dead. However, forward Ray Pigozzi finished off the play and put the puck in the back of the net, which prompted the refs to call it a goal. After reviewing the play, the officiating crew determined it was a good goal, despite having blown the whistle prior to it being scored. 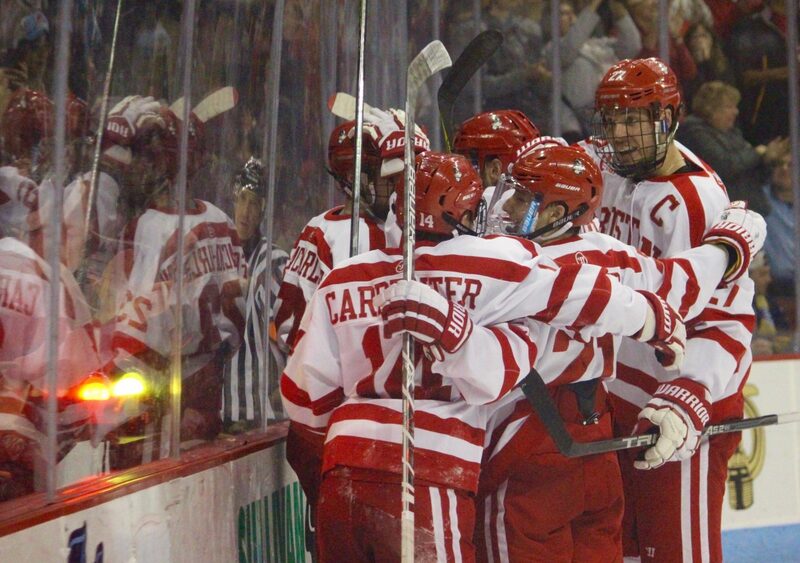 It was a pretty successful past week for BU, taking wins against the University of Massachusetts and then-No. 5 Harvard University (a wild one at that). The Terriers will look to build off that when they go into a two-game series against No. 4 Boston College this weekend. We just wanted to catch everyone up on some tidbits that you might have missed. 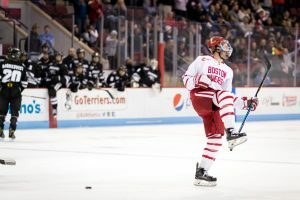 –Matt Grzelcyk was named both Hockey East Player of the Week and NCAA Hockey’s Second Star of the Week for his four goals and one assist in two games against Harvard and UMass. -BU’s two wins moved them up one spot to No. 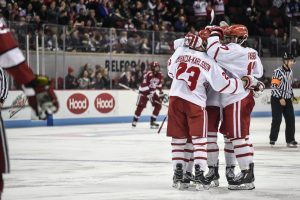 10 in the USCHO.com Poll. The Terriers sit at No. 9 in Pairwise. -Get to know BU newcomers Oskar Andren and Erik Udahl a little better with the 20 Questions Sarah and Judy asked them. 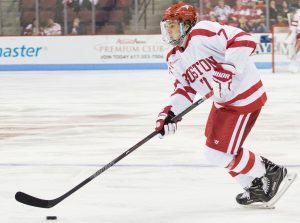 -Sarah also joined WEEI’s Scott McLaughlin on his College Puckcast to discuss the upcoming games against BC. Give it a listen. -Ryan Lambert of Puck Daddy looked at BC’s newest goalie, Ian Milosz, and how he performed well in place of Thatcher Demko against No. 3 Providence College. 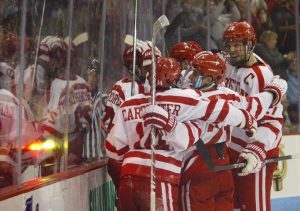 It appears the Boston University men’s hockey team has worked quickly to fill the recent hole left on the team’s roster. Oskar Andren, a 20-year-old forward playing in the NAHL, has announced his commitment to play at BU, starting in the second semester of this season. Andren’s announcement comes one day after a source confirmed with The Daily Free Press that sophomore forward A.J. Greer has left BU for the QMJHL. A native of Danderyd, Sweden, Andren has played his last two seasons with the Lone Star Brahmas. He had 47 points (18 goals, 29 assists) in 51 games last season, and has 22 points in 28 games this year, which is tops on the team. Andren is the first commitment from an NAHL player since Ryan Santana made his decision to come to Commonwealth Avenue in 2008-09. The Lone Star coaching staff gave Andren praises in a statement published on the team’s website. There’s a lot of good players in this league, and when you’re a top team, you’re going to lose players,” head coach Dan Wildfong added. “That’s a good thing because they’re moving on to where they want to go. Andren went through a lot and when the scholarship came, to reach that goal, we were all excited. We trusted him and believed in him and we’re proud of him. He couldn’t have asked for a better school. With Andren’s commitment, the Terriers get more offensive depth and their roster goes back up to 15 forwards and 26 total players for the second half of the season.